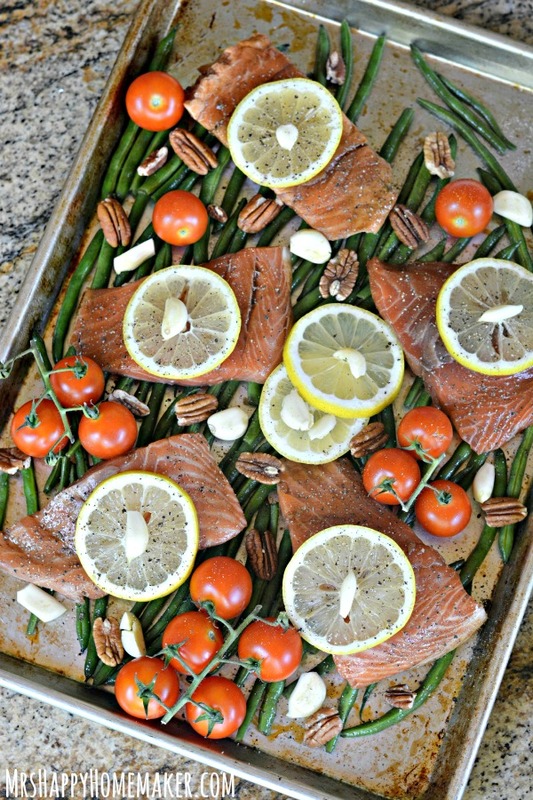 Ginger Teriyaki Salmon & Green Beans, with roasted tomatoes, lemon, garlic, & pecans, all cooked together in unity in this super simple one sheet pan meal! DELICIOUS! My daughters just finished up a mission trip with their grandpa’s church building additions onto low income family’s houses. After the mission trip, they went back to their grandparents’ house (my parents) who live about 4.5 hours from us. They’ve been gone for a little over a week so far & will be gone for a few more days. 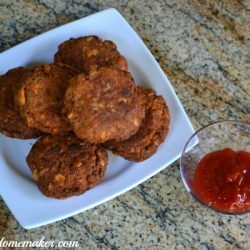 I thought that they while they were gone, I could cook less – but boy, I was wrong. I’m left here, outnumbered, by 2 boys. 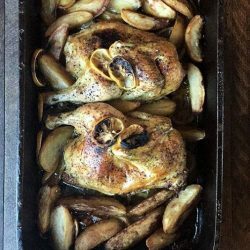 I always thought that my teenage daughters carried their weight when it comes to eating, so without them here – I’d be obviously cooking less food. Um, no. Again, I’m left with 2 boys here. There is no cooking less. They just pick up my daughters’ slack. Even my 5 year old boy…. I’m over here like, where are you putting that at, son?! But since I’m loaded down with my adult chores & my kids’ chores (insert pitiful face here) – when it comes to feeding the hungry mongrels left behind, the easier the better. 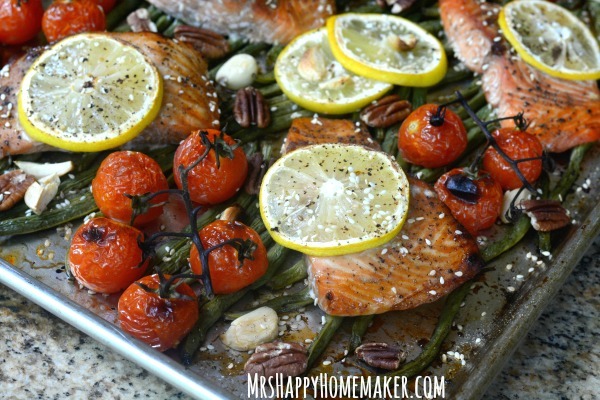 Cooking your entire meal on a baking sheet…all together on a baking sheet? Yup, that’s what I’m talking about! Here’s what you need. See even the ingredient shot is all pur-ty. 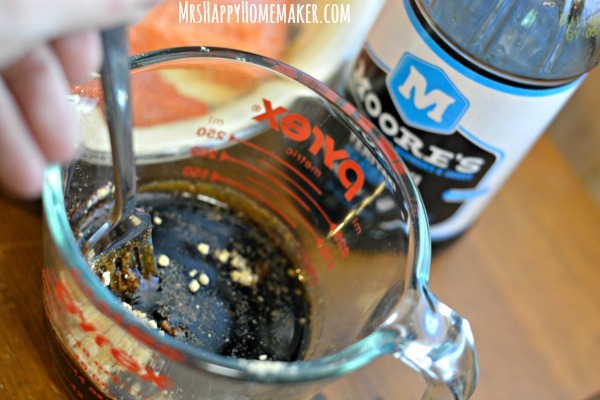 Mix 2 tablespoons of ground ginger in 2 cups of teriyaki marinade (I used Moore’s Marinade). 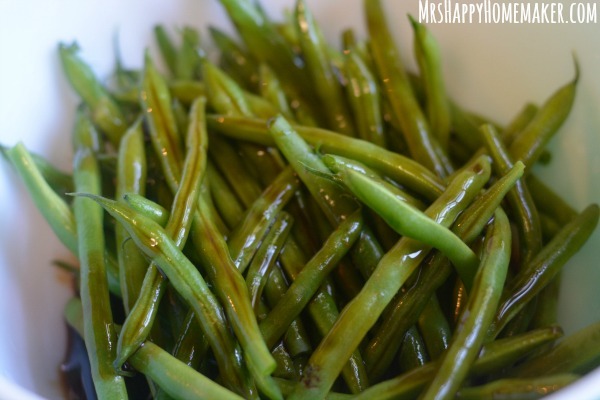 Pour half of it over 1 pound of fresh green beans (with the stem ends removed if need be). And pour the other half over 4-5 salmon filets. Let the salmon & green beans marinade in the fridge for 30 to 45 minutes. 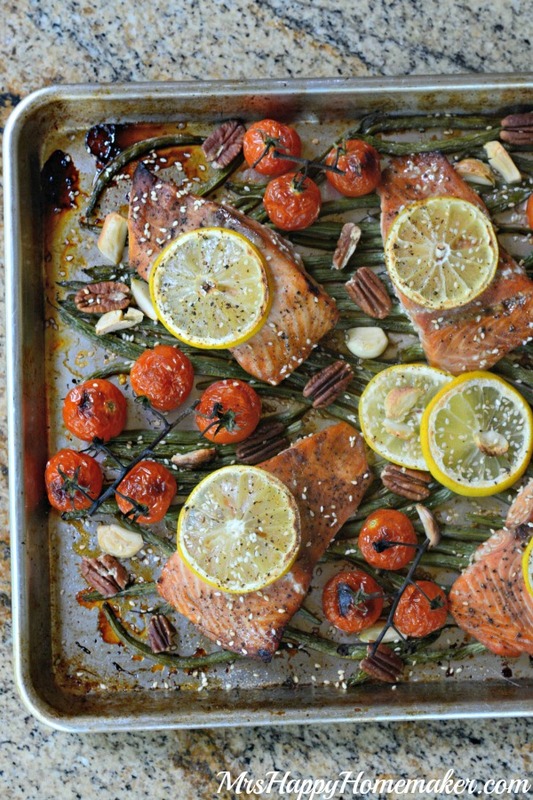 Remove the salmon & green beans from the marinade and place on a baking sheet that’s been sprayed with non-stick spray. 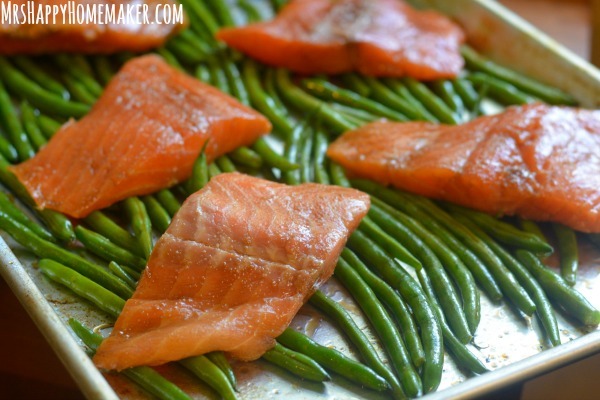 Lay the green beans on the pan first, and then place the salmon filets on top. 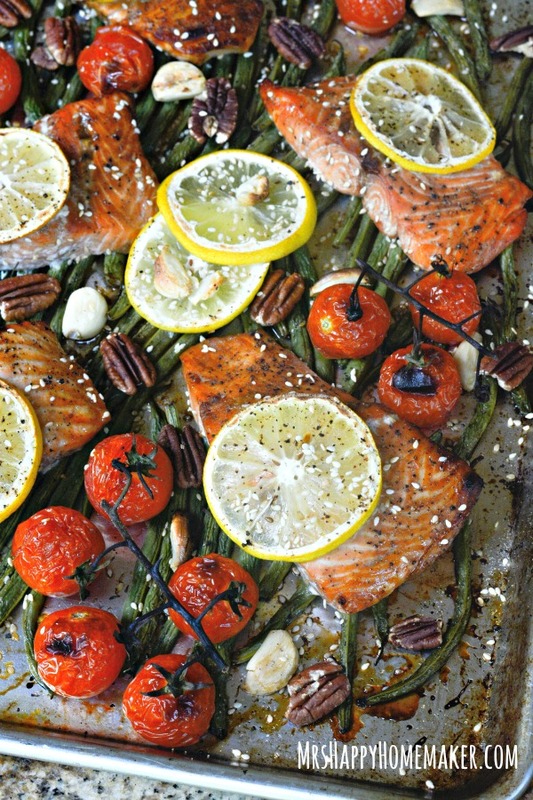 Arrange cherry tomatoes over the green beans & sprinkle with pecans. 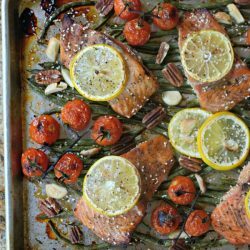 Place a lemon slice on each salmon filet & garlic cloves on top of the lemon (and sprinkled anywhere else if you desire). Drizzle 1/4 cup of teriyaki sauce over the entirety of the ingredients on the baking pan, then sprinkle with salt & pepper to taste. I actually used garlic salt & pepper though. Cook at 400 degrees for 17-20 minutes. Turn the oven to broil for 1-2 minutes afterwards to achieve the nice roasting on the tomatoes. 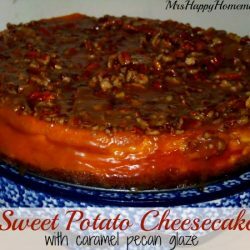 Oh man, this is sooooo yummy! 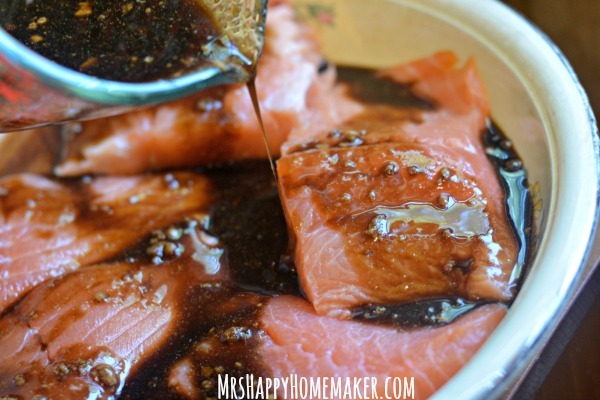 Combine 2 cups of teriyaki marinade with 2 tablespoons of ground ginger. Pour half over the green beans & the other half over the salmon (using large ziplock bags for this helps a lot with the marinating process, squeezing out any extra air). Place in the fridge to marinate for 30-45 minutes. 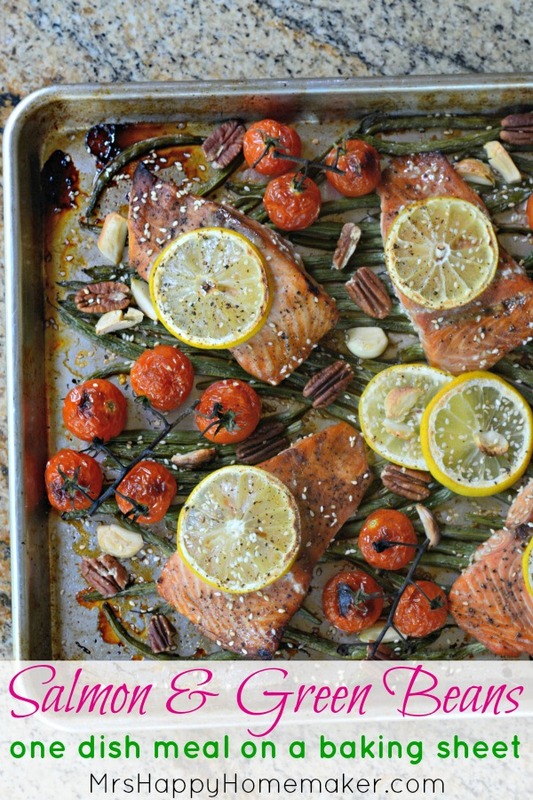 On a large sheet pan, spray with non-stick cooking spray (you can line with tinfoil if you like). 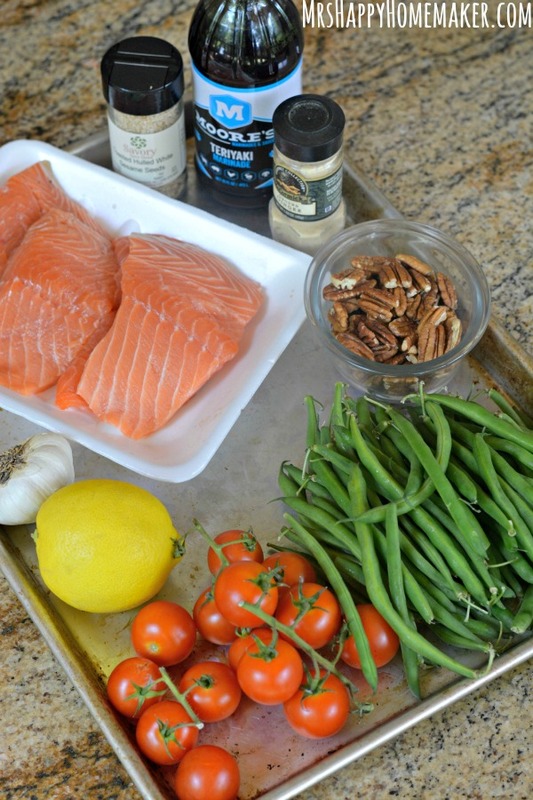 Remove the salmon & green beans from the marinade, and arrange on the pan. 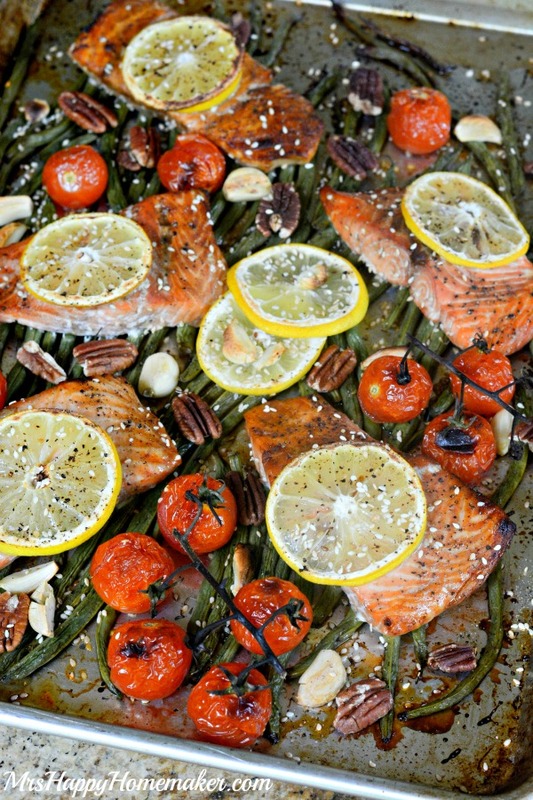 Spread the green beans out over the entirety of the pan first, then top with the salmon filets. 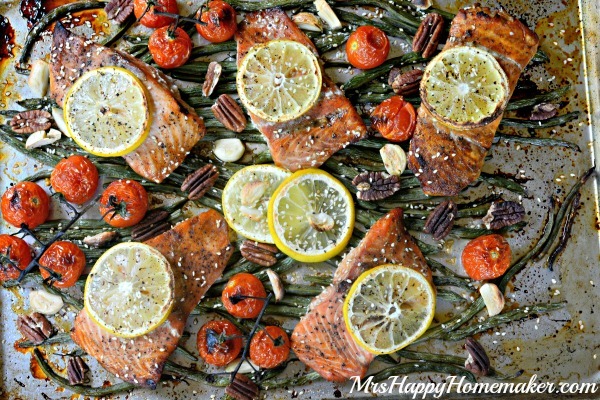 Arrange lemon slices & a piece of garlic over top each salmon filet. Distribute the cherry tomato bundles over the pan & the pecans (if using). Drizzle with the remaining 1/4 cup of teriyaki marinade. Sprinkle with salt (or garlic salt as I like using) & pepper. Bake at 400 degrees for 17-20 minutes, turning the oven to broil the last 1-2 minutes to achieve a nice roasting color on the veggies.